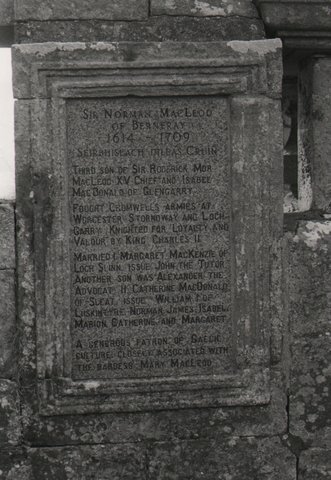 Sir Norman Macleod of Berneray was knighted for his loyalty to the royal cause by King Charles II, having fought Cromwell’s armies at Stornoway, Worcestor and Loch Garry in the 17th Century. The burial plaque above is at St Clements Church, Rodel, where the knight was buried. Another reminder of the knight is the Gunnery on Berneray, which is the oldest building on the island and bears a marble slab above the doorway commemorating the site as his birthplace. This entry was posted in Uncategorized and tagged Berneray, Friday Photo, Rodel, Sir Norman Macleod of Berneray. Bookmark the permalink.